Example using the PointCompression Class. In this example the encoded string “x90uhio4sQmhuGwxrGz8sGp-zP5ooKpx9Eiz7Ip2vFko8E56xEl-zEyhkG” is decoded into an array of Locations. The array of locations is then displayed on the map as a Polyline and map view set accordingly so that we can see what it looks like. To demonstrate and verify the encoding/decoding logic this example then encodes the Locations and compares the two strings to ensure they are the same. //Display the locations as a polyline on the map so we can see what it looks like. //Set the view of the map over the polyline. //Verify that the encoded string and new encoded string match. Running this code will display a Polyline, that is derived from the provided encoded string, on to of the map. 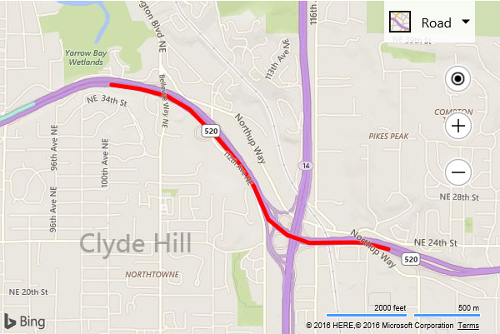 In this case it represents a section of the 520 highway in Bellevue, WA.